On the 50th anniversary of the U.S.-supported overthrow of Joao Goulart in Brazil, his son, Joao Vicente, has petitioned the Brazilian Senate to officially request the declassification of still secret U.S. documents on the covert operations that contributed to that dramatic coup d’tat. Given the bilateral tensions in current Brazilian-U.S. relations—generated by a more modern form of US penetration in Brazil’s internal affairs—it seems unlikely that the Obama administration will release such documentation anytime soon. Yet if there was ever an opportunity to use declassified U.S. historical records as a unique diplomatic tool that time is here, and now. The U.S. government has, in fact, practiced the art of declassified diplomacy in a number of nations—reviewing and releasing thousands of records stored in the “secure compartmentalized information facilities” (SCIFS) of the CIA, the Defense and State Departments among other national security agencies—as diplomatic gestures, as well as to advance the pursuit of human rights, truth and justice. Like other foreign policy tools—economic aid, trade, and diplomatic support–these historical records can provide a potent contribution to advance U.S. interests in stability and a peaceful and more just global community. In Ecuador, for example, despite tensions with the populist government of Rafael Correa, the administration of George W. Bush made an important gesture of a special declassification of State Department records to assist the Ecuadoran truth commission. In Chile, after the arrest of General Augusto Pinochet in London, the Clinton administration ordered the review and release of 23,000 secret documents. In a public ceremony at the Biblioteca Nacional in Santiago, the U.S. Ambassador, John O’Leary, turned over dozens of binders filled with declassified CIA, NSC, State and Defense Department records. In Guatemala in 2011, the U.S. Embassy and USAID donated an installation of hi-speed computer terminals in the reading room of the General Archive of Central America in Guatemala City and a special collection of declassified records. The gift, explained U.S. Ambassador Scott McFarland, was intended to provide victims’ families with access to the collection, “Death Squads, Guerrilla War, Covert Operations, and Genocide: Guatemala and the United States, 1954-1999”—compiled by National Security Archive senior analyst Kate Doyle—which contains over 2000 CIA, State and Defense Department documents. To its credit, since the mid 1970s the U.S. government has been declassifying secret documents on its role in the Brazilian coup, through routine declassification procedures and the U.S. Freedom of Information Act. Even the White House tapes of Presidents Kennedy and Johnson discussing the intricacies of coup plotting, regime change, and military intervention in Brazil with their aides are now available for public scrutiny. From these records we know many of the secret details of “Operation Brother Sam”—the Pentagon’s plan to provide guns, gasoline, and even combat troops if needed, to secure the success of the military coup. “We wouldn’t want the Brazilian military to move until we have everything in place,” states one Top Secret White House memorandum dated March 30, 1964. Nevertheless, the covert actions of CIA agents in Brazil at that time remain deeply classified. 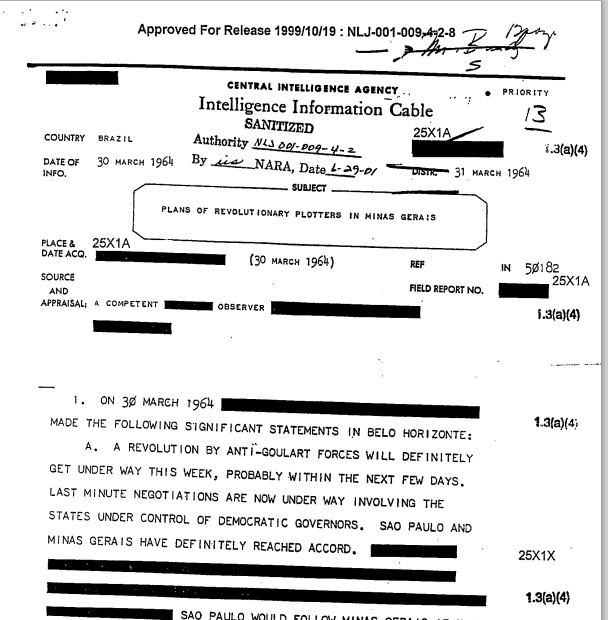 The March 30, 1964, CIA Intelligence Information Cable, “Plans of Revolutionary Plotters in in Minas Gerias” – one of the declassified documents on the 1964 Brazilian coup posted by the National Security Archive. For a proud and independent nation such as Brazil, the imperial arrogance and audacity reflected in these records are offensive, to say the least. But if there is one positive outcome of the significant U.S. involvement in the coup and support for the military regimes that followed over the next twenty-one years it is the detailed historical record left behind. The secret archives of the U.S. government contain thousands of cables, reports, intelligence assessments and memorandums of conversations that can, and will, shed light on the era of repression in Brazil. One declassified 1973 State Department cable that my office recently provided to the Brazilian National Truth Commission, for example, actually reveals the existence of a military intelligence center in the Sao Paolo district of Osasco where systematic and grotesque violations of human rights abuses took place. One of the torturers from that center bragged to U.S. officials about using the infamous parrot perch torture technique to break the will of prisoners. He also offered a “first hand account” of an execution technique he called “sewing the suspect up…shooting him from head to toes with automatic weapons.” It was “standard procedure,” the U.S. Embassy reported, to kill suspected “terrorists” in São Paolo. The Brazilian military and intelligence services appear to have disappeared their own dark archives–just as they have disappeared their victims. For that reason, declassified U.S. documents will prove invaluable to the ongoing work of the truth commission in Brazil, as well as to citizens here and in the United States who have a right to know their history, as well as a right to justice. It is a right that remains fundamental to the democratic health of our societies. Peter Kornbluh directs the Brazil Documentation Project at the National Security Archive, a public interest research center in Washington D.C. that specializes in declassified foreign policy records. This article first appeared in Portuguese in Folha de S.Paulo.